If you search your ancestors in San Potito Ultra, Campania, info about your Italian family are stored in the City Office archives or at the parishes. In towns and villages of Campania and in Avellino province registry offices were established in early 1800: it means that you could find information in San Potito Ultra registrar as of that date. So, if your ancestors were in San Potito Ultra in the nineteenth or twentieth century, then you could try to contact the City Office of San Potito Ultra to know more. Before to start your genealogy research in San Potito Ultra, we suggest you to read our tips for your search . They are useful to search in Campania and in San Potito Ultra too. 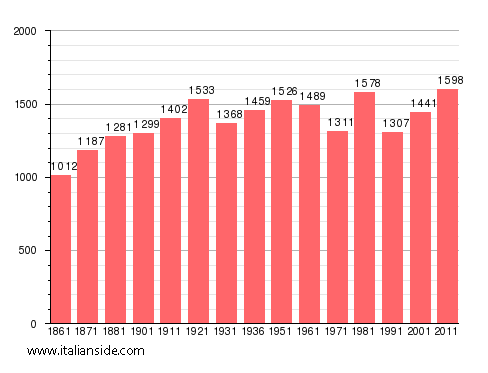 Next picture shows the demographic trends in San Potito Ultra from the Italian Unification (1861) an important info to understand how many people lived there in the past. It could be important to know if the last name you are investigating is a frequent surname in San Potito Ultra. As more your surname is common in San Potito Ultra, as more it could be difficult to find the right info about your ancestors in San Potito Ultra archives if you have not exact dates. 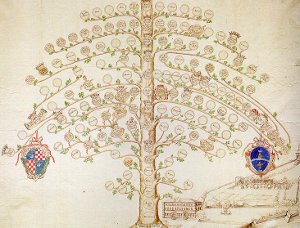 Albanese, Bruno, Capobianco, Capone, Carbone, Cardinale, Caruso, Cioffi, Cipriano, Colucci, Coppola, Cucciniello, De Feo, De Luca, De Maio, De Simone, De Stefano, De Vito, Di Pietro, Esposito, Famiglietti, Ferraro, Festa, Fiore, Forgione, Gallo, Grasso, Graziano, Guarino, Guerriero, Iannaccone, Iuliano, Lepore, Lo Conte, Lombardi, Luongo, Matarazzo, Napolitano, Nigro, Petrillo, Picariello, Romano, Ruggiero, Russo, Santoro, Sarno, Spagnuolo, Vitale. Church archives in Avellino province may instead contain even older information, but they are far less accessible from abroad (and almost impossible by email). Then,parishes send information not easily. If you have the opportunity to visit San Potito Ultra and Avellino province, you could plan to investigate churches’ archives by yourself, but from abroad is very difficult to obtain any result unless you find a reliable local help. Another important source of information is the “Archivio di Stato” (National archive) in Napoli. If your research is in a dead end and you need professional help from our local Italian genealogists write to sanpotitoultra@italianside.com our expert in San Potito Ultra area will study your request and will reply to you with a research plan and a quote. I am trying to get information about Severino Tirella born in San Potito about 1865. He was married May 4 1893 to Concetta Piasente in San Potito. I am trying to get information about my great grandparents. They were parents of Severino (Sam) Tirella born in San Potito 1877. . Parents listed as Alphanso Tirella and Phliomene ?, but no other records. Severino was married to Etilia Falzione. Severino lived in Morristown and Dover NJ. Had a grocery store in Dover, NJ. Looking to meet relative on our next trip to Italy in October 2017. My family is Nazzaro from San Potito also. My grandfather was Peligrino and settled in Dover, NJ. What information do you have about the Nazzaros? We will be visiting San Potito this year. No one from my family is alive so I cannot ask for details. My grandparents are from San Potito. They emmigrated to the United States in 1915. My grandfather’s name was Miguel Mauriello and was born in 1900. He had 2 brothers, Dominic and Anthony. His father’s name was Dominic. My grandmother’s name was Giovanna D’Agostino and their son (my father) was named Orlando. Is there some way to find any living relatives? Had he lived a longer life, my father would have been in his 90’s. Perhaps he has a 2nd cousin who might be in his/her 60’s or 70’s. I would appreciate any suggestions for finding a relative. My great grandparents were married in San Potito Ultra. Her maiden name was Mauriello. She was born 8 Aug 1877 and immigrated to the US in 1904. Her father was Michele and her mother was Maria Ciardo. I am interested in finding any information about or connecting with anyone with the surnames Cavallo or Moschella., These were the surnames of my great grandparents who were from this place . I am also interested in learning if there were any newspapers covering local events during the late 1800’s and early 1900’s or any type of coronorers reports kept by the authorities . I am the only one in my family interested in the family history and in speaking with some of my older family members heard a story that I would like to either document or disprove.Also if there are land records such as deeds for transfer of real estate and where they would be located. Finally I would like to know if there are any cemetaries nearby where there might be tombstones I could search for. I am hoping to come and visit the town in the future and since I am very interested in history and family history I would like to spend some time researching. I’m looking for Moschella Family in San Potito. I live in Massachusetts and will be Italy this year. Grandfather and brothers came to Boston, Aunt stayed in Italy. I am trying to search for information on my 2x great grandfather Pietro Tirella born 1870 in San Potito Ultra. I know his father’s name was Carmino Tirella. I was wondering how I can go about contacting the church for his baptismal and marriage records. I would like to confirm that Pietro Tirellas’ mother’s name was Guiseppa Mele and that he married a woman Giovanna Dauria before coming to America around 1899. Any assistance on who I can reach out to to assist in my church would be greatly appreciated. My family is very interested in learning more and I would especially love to give this information to my grandmother who is so interested in learning more about her family. If you would like to start a research in San Potito Ultra please send your request to sanpotitoultra@italianside.com.